Interested in buying a cordless strimmer for your garden? Then be sure to check out some of these great products! With a powerful 36V Lithium-ion battery, the Black + Decker 36 V Lithium-Ion Strimmer packs enough punch to strimming even the toughest of areas. It’s also got a seriously impressive battery life and a quick recharge time, making it one of the best performing cordless strimmers available today. The performance of the strimmer is further enhanced by Back + Decker’s innovative E-Drive Technology, providing a high torque gear system that enhances the cut rate of the strimmer that will make quick work of even the most overgrown grass and weeds! With a total cutting speed of up to 8500rpm and a 30cm cutting swathe, expect this cordless strimmer to cut through most types of grass with the upmost speed and ease. This is made even easier with the inclusion of a telescopic handle, which allows you to adjust the strimmer height as needed, helping to get the perfect height for easy use. As for the battery life, the 36 V Lithium-Ion Strimmer offers 3750 linear metres in a single charge, which should be enough for most garden sizes with a single charge. Should you need to recharge, the battery can be fully recharged in an impressive 90 minutes. A very cool feature is the ability to switch into different power modes. Using Power Select Mode, you can easily go between eco mode and turbo mode. Eco mode is ideal for light strimming while turbo mode is perfect for those tougher spots, so it’s great to be able to seamlessly switch between power modes. Better still, using the 36 V Lithium-Ion Strimmer should not be strenuous for most people, as it weighs just 3.5kg! Combined with a dual handle design (including the telescopic handle), manoeuvring the device is a lot easier than many bulkier strimmers. The Black + Decker 36 V Lithium-Ion Strimmer is certainly one of the best cordless strimmers available. It comes with plenty of power, a fantastic design that makes it easy to use, as well as a range of features and functions that make strimming even a larger sized garden quick and easy. Bosch is a leading manufacturer of garden tools, so its unsurprising to see they have a fantastic cordless strimmer with the Bosch ART 30-36 LI. It’s designed for use in large gardens (although it will certainly do a fine job in smaller locations too), with a sizeable enough battery to take on even the toughest types of overgrowth. The 36V Lithium-ion/2.6 Ah battery offers the perfect amount of power for strimming large areas with ease, and an impressively high run time of 35 minutes. As the ART 30-36 LI is designed for use in larger gardens, there is a chance that the 35-minute run time isn’t enough to cover the entire, but this shouldn’t be much of an issue as the battery can be fully recharged in around 90 minutes. You should also be able to get the right amount of power needed for most types of grass by using the two-speed trigger. Offering speeds from 7600 – 8200rpm, switching between speeds allows for optimal power depending on the type of grass you need to cut. The trigger for this is found on the underside of the handle, which sports an ergonomic design for the upmost comfort when handling the ART 30-36 LI. It’s also extendable to several heights, so you can find the perfect setting for comfortable handling. Handling shouldn’t be much of an issue in most cases mind you, with the strimmer weighing a relatively light 4kg. The strimmer is also well balanced, so even using the ART 30-36 LI for longer periods will not be too strenuous. Other handy features round of the ART 30-36 LI, including a plant protector for precise trimming and avoiding damage to fragile plants, a secondary adjustable front handle for getting the right fit, and a twin line spool system for an even better cut. All-in-all, the Bosch ART 30-36 LI is a great strimmer that is perfect for use in large gardens or locations with tougher growths. Worx is another well-regarded manufacturer of garden tools, as evidenced by the Worx WG169E 20V Strimmer. A great-sized battery and the ability to change into different cutting modes by the Worx WG169E a fine addition to gardens of many sizes, although you may find it a struggle in very large spaces. However, there is still plenty of features and functions that make this a fantastic cordless strimmer, as well as a very reasonable price that many will appreciate. The 20V lithium-ion battery is certainly powerful enough to cover most average size gardens, and is much lighter than batteries offering more power, making it especially suitable for those looking for a lightweight cordless strimmer. A downside to this is that the battery requires longer to charge, so be mindful of the 3-hour charge time. While this shouldn’t be an issue thanks to the impressive 30-minute run time, it could be a problem in very large gardens that require longer to strim, where the 3-hour recharge speed becomes more of an issue. Therefore, it may be best to avoid buying the Worx WG169E if your garden space is quite large. It still has the power to handle large spaces, it’s just that the recharge speed might be frustrating for anyone looking to complete their strimming as quick as possible. Perhaps on the best aspects regarding this cordless strimmer is the ability to adjust it to your needs. For instance, the head of the strimmer tilts a full 90 degrees, while the handle and telescopic shaft are both adjustable to several settings. There’s even a set of wheels on the head, so when adjusted to certain positions you can convert it into a mini-mower or edger! This offers a lot of versatility and is great for anyone that loves to get a precise cut or some minor mowing done, making the Worx WG169E a fine choice for many gardeners seeking an affordable but powerful cordless strimmer that comes with some nice extras. The DEWALT DCM561P1-GB 18V Li-Ion XR Cordless Brushless Line Trimmer comes with one of the most impressive cordless strimmer motors, resulting in fantastic recharge speeds and runtimes. Combined with a sizable battery and a range of features to make strimming easier, there is plenty to like with the DCM561P1-GB. 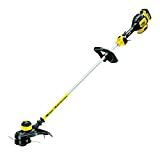 A cutting swatch of 33cm makes it suitable for small and large spaces, as does the 18V 5.0 Ah battery and two-speed variable setting. For instance, you can set the speed to 4600rpm on the low setting, which results in a longer run time of around 45 minutes. The higher speed setting results in a more powerful 6000rpm but a shorter run time of about 25-30 minutes, so it’s possible to cut many different types and lengths of grass as needed. This is further enhanced by the 400 MWO brushless motor within the DCM561P1-GB, which offers more torque and sustained cutting speeds under different conditions. So, if you’re looking for a versatile strimmer that allows you to go between using longer run times and increased power setting, the DCM561P1-GB has you covered. Better still, this allows for a notably fast recharge time of just 75 minutes, making the strimmer even easier to use in larger spaces that may run the battery dry. The DCM561P1-GB is rounded off with some nice finishing touches, such as a professional style garden for added protection, a double handle design for easy manoeuvrability, and fast loading dual line string that can be adjusted to different sizes as needed. A powerful cordless strimmer with some seriously impressive mechanics, the DEWALT DCM561P1-GB 18V Li-Ion XR Cordless Brushless Line Trimmer is certainly one of the best cordless strimmers out there. Another brilliant cordless strimmer from Black + Decker is the 18 V Lithium-Ion AFS. Sporting the trademark E-Drive technology from Back + Decker, the strimmer has a high torque gear system that makes it capable of dealing with long and rugged growth without any type of clogging. This generally makes the strimmer perform to an incredibly high standard, even though it has a somewhat smaller 18V lithium-ion battery. It’s perfect for strimming areas around walls, fences, and paths, not to mention being a fantastic edger for your lawn. In fact, the inclusion of the Trim n’ Edge feature makes this strimmer one of the best for precise edging. Simply twit the pole of the strimmer and to switch from trimming and edging modes, with a handy edging wheel offering precise guidance for getting that perfect edge around your lawn border. The auto feed system included with the strimmer ensures you never need to waste time attempting to change the string once it wears away. Instead, the strimmer detects when the string has broken off or worn away too much, automatically feeding a fresh piece through without ever stopping the strimmer. 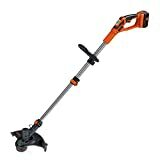 Moreover, the BLACK+DECKER 18 V Lithium-Ion AFS Strimmer comes with a very reasonable price. It’s got the perfect balance between performance and affordability, so many will certainly want to grab this cordless strimmer for their gardening needs! Flymo are one of the best producers of garden equipment, and the Flymo Contour XT Cordless Battery Grass Trimmer and Edger is no exception. Coming with an exceptional price and a host of features that is perfect for small and medium sized gardens, this is one of the best entry-level cordless strimmers out there. As the battery is an 18V/1.6Ahr NiMH, it isn’t the most suitable cordless strimmer for large gardens, being best used in small to medium sized areas. Still, it provides a rather impressive run time all the same, with approximately 25 minutes on a single charge. The Flymo Contour XT is certainly a useful strimmer for maintaining small lawns and grassy areas throughout the garden, especially for edging and trimming. This is thanks to a very handy edging wheel at the head of the strimmer, which can rotate into a few positions for optimal edging and trimming! It is also an incredibly lightweight cordless strimmer, weighing just 2.5kg. This is perfect for anyone that might struggle to move a heavier strimmer around, such as elderly gardeners, being very easy to operate even for extended periods. While not the most powerful cordless strimmer, the Flymo Contour XT Cordless Battery Grass Trimmer and Edger is still a worthwhile option for those looking for an affordable model that’s easy to use. Plus, not every garden requires the most powerful strimmer – this will certainly be a great option for many! Garden strimmers have come a long way in a short time. Previously an expensive and cumbersome piece of equipment, strimmers are now an affordable and highly functional device that are capable of making garden maintenance even easier. Yet one of the main drawbacks that still effects modern garden strimmers is how restrictive they are. Even with a long cord, strimmers are often difficult to manoeuvre and can struggle to reach every area of the garden, especially those larger in size. One of the easiest ways to resolve these kind of issues is by getting a cordless strimmer! Since improvements in battery technology have been made, cordless strimmers have come on leaps and bounds, giving all the more reason to consider buying one if you’re looking for a strimmer! What is a cordless strimmer? As the name suggests, a cordless strimmer is an electric garden strimmer that doesn’t have cord that needs to be plugged into a power source. Powered by a rechargeable battery, cordless strimmers work as well as any corded electric strimmers, while also being far less restrictive and generally easier to use. Most modern cordless strimmers are powered by a lithium-ion battery, which provides them with a much better running time and allows them to be charged much faster than with previous any types of batteries. As result, a great cordless strimmer performs just as a well as corded types, as well as being just as affordable! Probably the most important feature to look for on a cordless strimmer, you want to ensure it features the best battery type, which is a lithium-ion battery. Simply put, these are unequivocally the best battery for a cordless strimmer, so be sure to remember this if you are thinking of buying a cordless strimmer that uses a different battery type. Lithium-ion batteries offer a significantly longer battery life, allowing you to use the strimmer for much longer before needing to recharge, while also providing a very fast recharge rate. The bigger a cordless strimmer’s battery, the more powerful the strimmer is. For instance, the smallest batteries are often around 12V, typically used for more affordable entry-level cordless strimmers. The largest batteries offer a much more powerful strimmer that feels similar to a petrol-powered strimmer, with batteries coming with 72V and upwards. Be sure to select a battery size that offers enough power for your strimming needs! Amp hour (Ah) is also something advertised on cordless strimmers, relating to the running time that the battery offers. Most cordless strimmers have at least 1.3Ah, and will tend to go as high as 6Ah with some models. So, the higher the Ah rating, the longer you can expect the strimmer to last on a single charge. However, the higher the rating goes, the heavier the battery will be, so it’s worth remembering for anyone that may struggle to use a heavy cordless strimmer. Of course, not everyone requires a long charge for their strimmer, as some gardens are too small for it to really matter. Around 20 minutes charge is a perfectly suitable time for most average gardens, while those on the larger side may need more time – or a faster charging time! Cordless strimmers need to be charged regularly, so it’s a good idea to choose one that charges in a suitable time frame for your needs. For example, if you plan on strimming large spaces then a quicker charge time will likely be something you need, as it can be rather frustrating having to wait a while for the strimmer to recharge before you can continue strimming. Recharge speeds can vary a fair amount, from as quick as 30 minutes to as long as several hours. Batteries with faster recharge speeds can hike the strimmer price up mind you, but it may be worth it in the long-term. Many consider buying a second battery to compensate for slower recharge speeds. While a second battery will cost a fair amount, it’s certainly a good investment to make as the battery for a cordless strimmer will eventually need replaced over time. We have also reviewed the best petrol strimmers and models that use blades and not line. If you need something with a bit more power for tackling heavier bushes then you might want to consider looking at our brush cutter guide here. Above are what we consider to be some of the best cordless battery strimmers for sale in the UK for the money.